Our innovation: a next-generation high-performance MPPT, “Non-Perturbing Adaptation” method. This MPPT breakthrough innovation concerns off-grid photovoltaic systems as well as grid-connected ones, the MPPT being included in a solar charge controller, within a solar inverter or standalone. A) What is an MPPT? A) What is an MPPT (Maximum Power Point Tracking)? An MPPT (Maximum Power Point Tracking) is a tracking device that determines the ideal point of operation, or maximum power point, of photovoltaic modules (also known as photovoltaic solar panels). It takes into account the variations in sunshine and temperature, as well as the aging of the photovoltaic module. The MPPT controls the electrical converter to which it is connected. Thus, the MPPT controls the DC-DC voltage converter which transmits the optimum power of the photovoltaic module to the load (usually a battery). An efficient MPPT is thus the crucial factor in optimizing any photovoltaic installation: up to 30% extra power in the conventional case where the load is a battery, and much more for a load of resistive type (heating element, water electrolysis, etc.). 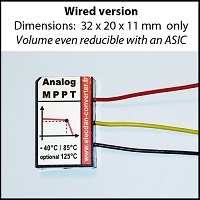 The quality of an MPPT is key to the efficiency of the solar charge controller (standalone or within a solar inverter). Since 1968, market-leading MPPTs have been following in the footsteps of NASA, with microcontrollers and other digital converters, along with their various constraining algorithms, and predictive measures by disturbing (distortive) currents. Currently, due to its high cost, the use of an efficient solar MPPT charge controller (within a solar inverter or standalone) is unfortunately not widespread, especially for small off-grid installations around the world. taking into account the inevitable cellular obsolescence of the module / photovoltaic panel. 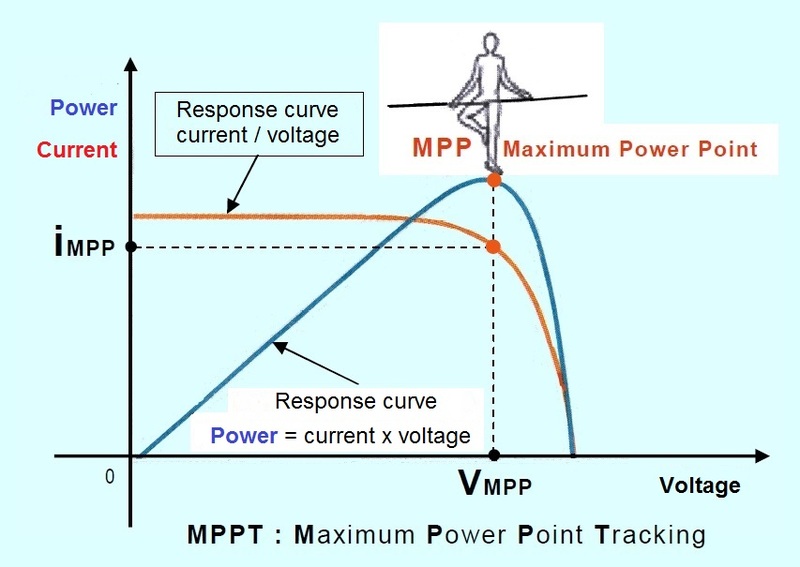 The curve “voltage x current” (blue) representative of the supplied power varies from zero to zero, reaching its “Maximum Power Point” for an intermediate voltage Vmpp. Thus, without MPPT, this optimum point is almost never attained. Our MPPT ingeniously maintains this “MPP”, not with successively predictive and corrective (and disturbing!) algorithms governing “voltage x current” calculations, but with a control resulting from an instantaneous analog analysis of the voltage of the curve “current / voltage” (red) in the vicinity of Vmpp. The performance of our MPPT solution has been validated, regardless of the power of the photovoltaic modules, at any time of the day, and even at low light levels. 1) Breakthrough innovation, both technically and technologically, characterizing our effective analog MPPT (with high efficiency close to 100%), radically different from the digital MPPTs derived from space research and which have been the subject of successive patents since 1968 (NASA). 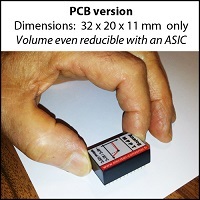 the microprocessor and its sophisticated, predictive and corrective algorithms. the diversity and remoteness of suppliers. 4) Automatic adaptation, allowing the parallel connection of additional and identical photovoltaic modules, thus allowing scalable installations. 5) Increased resistance to extreme hygrometries and temperatures (all climates from -40°C to 125°C; from -40°F to 257°F), and to local, meteorological or nuclear electromagnetic disturbances (ephemeral dysfunction thanks to the absence of disturbable memories). in DC-DC converters available on the market, for upgradation too. average growth of the photovoltaic market, up to 2050: 19 gigawatts per year, or about 200 million m2 of photovoltaic panels per year. This MPPT can also serve innovative projects involving new technologies or new applications in photovoltaics, whenever increasing reliability/efficiency and saving space/money really matter: intelligent solar panels, microgrids, etc.